Everyone believes and understands the importance of a refrigerator at any place. It is not only an efficient electrical unit that helps in preserving the food and eatables for future consumption but also ensure that during the hot summer days, you stay relaxed and cool. However, at times, these appliances malfunction because of the fault in some or the other parts. A faulty refrigerator is never acceptable at any point. Ice build-up is one of those many faults that lead the fridge to malfunction. Excessive frosting leads to the accumulation of ice in the freezer chamber and leads to the food to freeze. Therefore, this needs to be prevented to ensure that the fridge works properly. The owners of these electrical appliances need to follow some of the tips that would help to keep the ice from forming. Many people think that setting the thermostat of the refrigerator at quiet low will help in fast cooling and help keep the foods good. WRONG! Optimum temperature and humidity are sufficient enough to keep the fridge functional. Lowering the thermostat not only pressurises the compressor of the unit to work more but also leads to uneven cooling and malfunctioning. Frosting takes place at places where there are spaces for them to propagate. It is, therefore, advised to keep the different racks of the fridge always brimming with foodstuffs. This will ensure that there is no frost formation. The logic behind the formation of the frost is the availability of air in the chambers. This air condenses and takes the form of the frost. Experts suggest that to avert from hiring the professionals who deal with fridge repairs in Campbelltown for the issue of ‘frosting’, one can try out keeping containers of water that would freeze to blocks and help in the cooling. Most of the issues related to the malfunctioning of the fridge are only because of the mishandling. If you want the refrigerator to continue working as smooth as possible, it is advised to open the doors as less as possible. Make a plan of the requirements and pull those things out of the fridge instead of thinking what to choose while keeping the door open. Well, one of the surest ways to keep the things functional is to avoid the situations. In the case of ice build-up, it is suggested to brush off the crystal of ice or snow that forms in the freezer section on a regular basis. By not letting the snow to build on the surface will ensure that the optimum amount of ice is formed. 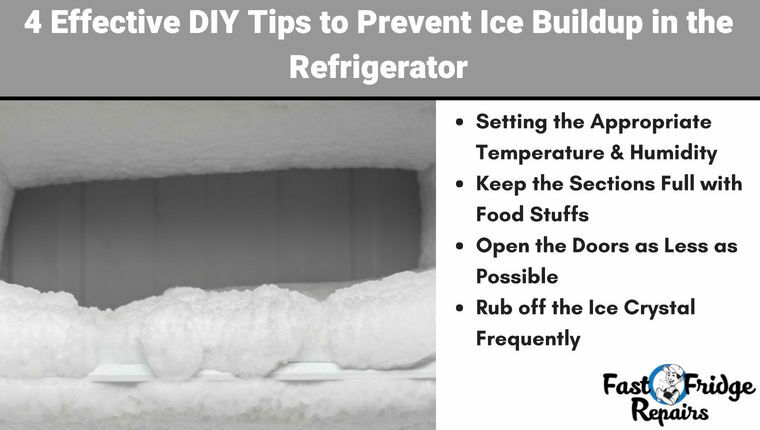 By following the right ways or techniques in DIY methods to keep the snow from forming will always help in averting the unnecessary fridge repairs. Experts believe that many of the incidents of the fridge malfunctioning have been only because of the lack of proper knowledge in dealing with the things aptly. Ice build-up is not a major issue. However, if not dealt with properly, it leads to the breakdown of the refrigerator. Previous Post: Are Pro Fridge Repairers Your Best Bet in Saving Money?